Guernsey is the second largest of the Channel Islands, and sits less than 30 miles off the French coast. Its proximity to Normandy, coupled with its mild climate, beautiful beaches and rugged cliffs, make Guernsey a popular holiday destination. Like the other Channel Islands, Guernsey has its own independent government called the States of Guernsey, which offers a favourable tax climate that has led to many offshore banks, insurance companies and fund managers establishing themselves on the island. There are also a number of high profile light industries based on Guernsey, including Specsavers Optical Group and Healthspan. Even though Guernsey’s economy is now largely focused on the finance industry, its traditional industries of flower growing, dairy farming and fishing continue to give Guernsey its unique and quaint local character. Guernsey is also renowned for its illustrious sporting heritage and boasts several top-ranked tennis players and Olympic gold medallists as residents. Guernsey’s rugby tradition is actually one of the oldest in the world, dating back to the 1800s. For sport and fitness enthusiasts, Guernsey offers a range of excellent sporting facilities and a year-round itinerary of sporting events which include the Guernsey Marathon and exciting rugby matches featuring Guernsey’s rugby team. 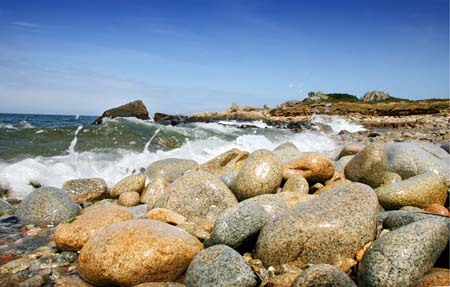 At New Forest Removals, we are well acquainted with all that this vibrant island has to offer, as we’ve been doing Guernsey removals for the last 30 years. As with Jersey removals, New Forest Removals offers a twice weekly service for those looking for shipping to and from Guernsey. When handling your move to or from Guernsey, we will ensure that your Guernsey removals are executed to the highest standards and with minimal inconvenience to you. For Guernsey removals, we also provide a part load rental removal service all the way to a full removal and container shipping operation to Guernsey. As with all Channel Islands removals, your possessions are completely covered by New Forest Removals’ full liability insurance whilst in our care. New Forest Removals is also sure to get you to or from your Guernsey property as easily as possible, even to the most difficult or awkwardly accessed locations, as we have small vehicles that are already on the island standing by to assist with getting to any tricky destinations. Guernsey removals can also include the transport of your car to or from any location worldwide. When it comes to Guernsey removals, or indeed to any Channel Island removals, New Forest Removals’ decades of expertise guarantees a smooth and stress-free transition for you to your new home or office. From the very first stages of packing up your possessions right through to transporting, unloading and setting up your effects, New Forest Removals will be right by your side to make your Guernsey removal all about the excitement and anticipation of a big move – without any of the stress! Guernsey Removals? Call today on 01590 623 777.